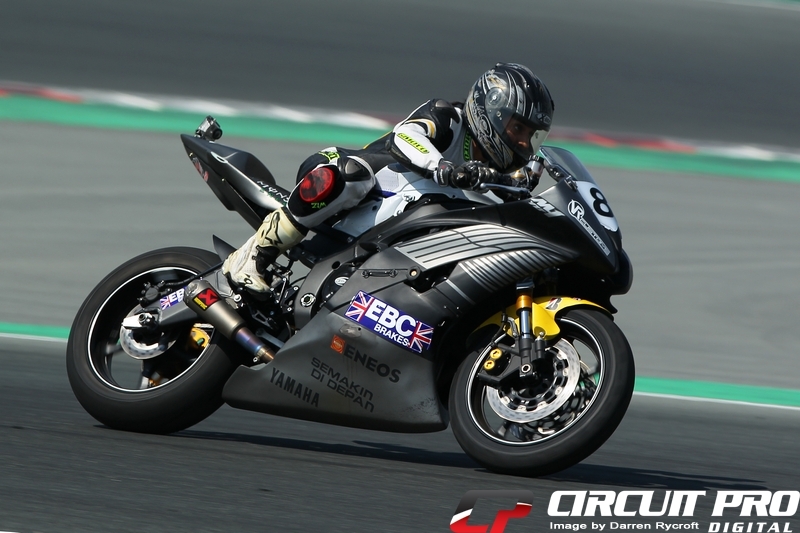 Dubai: Racer Diary with Sabah Mukri – Bike Middle East to the rescue!!! I was tempted to chicken out after our first test on a dirty & dusty track following the recent torrential rains here in Dubai. Not to mention riding alongside high profile riders such as Mishal Al Nuemi, Abdul Aziz and other fast racers from Qatar and Saudi Arabia. Richa Mergulahu racing official and event co-ordinator was so lovely and patient with me, she continued to assure me that the track conditions would improve and they were far from finished working on it. Dubai Autodrome manages to deliver; even with little time on their hands they were able to accommodate this weekend’s race, they changed the circuit configuration to international circuit and worked all of Thursday to get the track in the best possible condition for us to race. I was so pleased with how professionally they handled the situation and super keen to ride on that particular circuit. I had unfinished business with the International Circuit from the previous race, desperately wanted to break under that two minute lap barrier. On Race day my nerves got the better of me, I rode with a hesitant hand on my throttle, fearful to pin it. Qualifying at 2:07, I thought to myself today might not be the day I hit a new personal best. That’s where the pro’s step in! Watching them ride on the same surface using the same tyres, not complaining and got on with the job, that inspired me. It truly is all in your head, you create your own limitations! Warm up lap was where something clicked! I can only thank Abdul Aziz for this, as we went out he tapped his bikes tail and asked me to follow him, nearly side by side he asked me to stay with him, that was the first time I had gone passed my programmed braking marker in my head, of course I ran wide off the track but that’s the point. You create these breaking points thinking this is my limit, my comfort zone but it’s far from it. I realised I was capable of breaking much later and still able to control my corner entry speed. That’s where coaches and experienced racers are able to make such a great difference in your riding; words cannot explain what actions can! Had a great start in race one, was able to stick with the pack for the first four laps, surprising myself, every turn I’m still with them. Coming out of turn 16 on the 4th lap pinning my throttle I had one of the most severe head shakes my bike has ever given me, wouldn’t stop and nearly spit me off. First fear crossed of my list. Managing to stay on I rode down the straight watching Illyas disappear from my sight, as I approached turn one I reached for the brakes and felt nothing. The head shake was so intense it shook my brake pads back in the callipers and I had nothing, luckily I was pretty shaken up from the previous corner and wasn’t carrying as much pace and rolled off my throttle and carried it through. After pumping my brake lever slightly everything was back in place and I got my head back into the game. I tried my best to maintain the same pace but when you have no one to follow that sense of urgency disappears. Only to be recused by the fast racers when they lapped me and asked me to follow them once again. Crossing that checker flag for the third time in my life I let out a little scream in my helmet. In the pits I was approached by Vladimir an ex Moto 2 racer, and he said your dream came true, confused what he was talking about, Richa got the time sheet over to me smiling. I had done it, I had my fastest lap time at 1:59.5 I nearly crushed Richa I was so overwhelmed with joy. Out on the grid I had none other than Alan Boyter and Hussain Al Khoheji by my side, I was so pleased to have them with me, all they said was relax, breathe and enjoy!!! I think my over confidence from the previous start caught me off guard and as the lights went out and I stalled my bike, another fear crossed of the list. I re started the bike and launched into a wheelie and zoomed down the straight desperate to catch up with everyone, feeling so relived in turn two as I got close to the pack that I wasn’t as far behind as expected. This race I worked! I tried every corner to break later and later, careful not to pin the throttle too hard on the exit as I could not afford more lost time. All I wanted was to close that gap between me and Illyas, the only thing that was on my mind was do not let him out of my sight. I lost my front around the bowl and thought this was it, but my panic saved me as I jumped on the throttle the bike stood up and I managed to save myself from a low side, yet another fear crossed off the list. In the last couple of laps Abdul and Mishal lapped me and Illyas, offering their help as they rode passed showing us the racing lines to follow. Thanks to them I touched my PB twice in the second race. I watched in the distance as Mishal let Illyas cross the checker flag before him. A very humble gesture from him so as not to put a lap on him. Earlier that day Ahmeds bike had broken down and Nawaf let him ride his bike in the first race. True sportsmanship with no pride, no ego’s just true love of the sport. This race day was about breaking barriers and learning to put up, dealing with what you’re given and making the most out of a bad situation. I’ll be seeing you on the first of April.